After 15 years of waiting Ann Hartley had almost given up hope of a second baby - but then Louise Brown was born and her world changed. Ann was one of the first patients to be treated at Bourn Hall back in 1981. She returned recently to see how much it has changed. Ann was met by Vivien Collins who joined Bourn Hall over 30 years ago and – among her many other roles – helped to renovate the hall to become the place it is today. 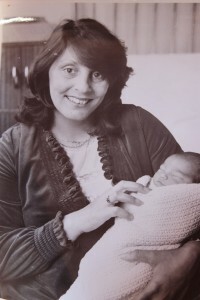 When Ann had IVF treatment Bourn Hall was very different from how it is today. The patients’ ward was in a portacabin and they stayed at Bourn Hall for ten whole days. Now potential parents are all treated as outpatients in a purpose built clinic. Ann laughs as she remembers the rudimentary methods from the early days of IVF. Patients had to lie with their legs in the air for three days, and then weren’t allowed to bath, drive cars or ride horses for eight weeks. If you are having trouble viewing this video you can watch it on YouTube here. Ann first heard of Steptoe and Edwards after the news of Louise Brown’s birth. After having surgery following the birth of her first child 15 years before, Ann had almost given up hope of a second baby. Fortunately she was able to get referred to Bourn Hall, and her dream of another child became a reality. At the time of Ann’s treatment she was one of 34 women being treated at the clinic, but as the success rate was so much lower then, she was the only one of them to become successfully pregnant at that time. As she remembers the other women with whom she spent those ten days, she is adamant that there was no bitterness, only support and understanding for each other. After her successful pregnancy test Ann did not return to Bourn Hall until 12 years later, when there was a reunion for the first 1,000 Bourn Hall babies. Meeting the other parents, who had also been blessed with a miracle child they never thought they’d have, really proved to Ann how great a positive influence Steptoe and Edwards have had on the world. Ann, who is now a grandmother, smiles as she remembers the men who made her dream of a baby come true. Click here to read about how Bourn Hall began and the legacy of Steptoe and Edwards.